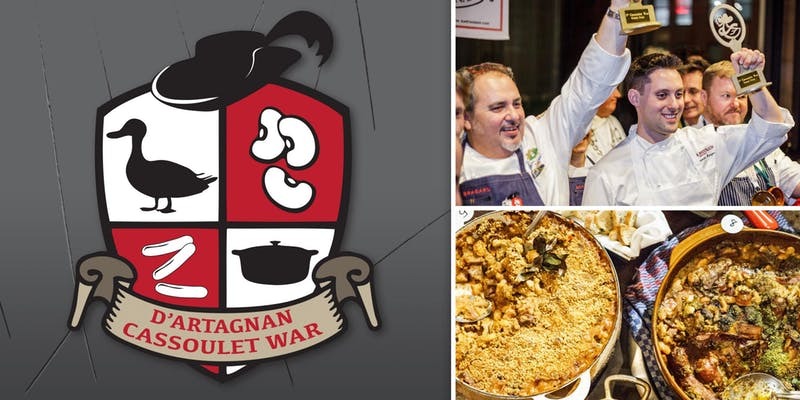 D'Artagnan is proud to carry on a competitive French tradition with our Fifth Annual Cassoulet War in New York City. On February 18, 2019, 30 chefs will battle for cassoulet supremacy at The Eventi Hotel. Join us to eat, drink and debate over which cassoulet is best. Our esteemed panel of judges will crown the "Most Authentic" and "Most Daring" cassoulet champions. You and all the other attendees will vote to choose the "Most Popular" cassoulet champion. Bring your appetite! This walk-around tasting includes plenty of Madiran, Cahors and Armagnac to drink. The battle begins at 7:00 PM and continues until only one chef is left standing at 9:30 PM. Plus a raffle! .... you might leave that evening with a round trip ticket to France, courtesy of La Compagnie airline, if you wish to accompany the winning chef at the Fete du Cassoulet in Castelnaudary!